So apparently B.W. 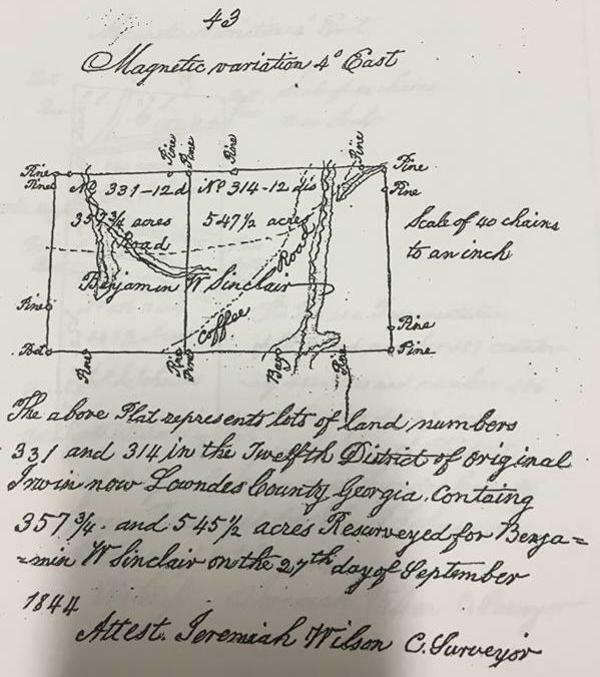 Sinclair owned 903¼ acres around the corner of what is now Jackson Road (marked on the Plat as Coffee Road) and Coffee Road (marked on the Plat as “Road”). That 27 September 1844 survey date makes sense. B.W. 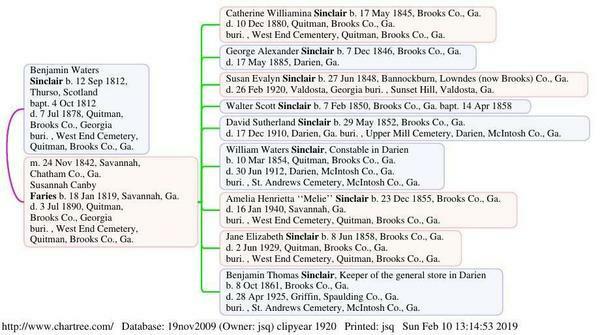 Sinclair was born 12 September 1812 in Thurso, Scotland. He immigrated to Georgia in September 1837, “sailing from Liverpool to 2 CONT Charleston, S. C., on the ship ‘Victoria’”, according to my aunt Jane Sinclair Quarterman, his great-granddaughter, who knew his children and grandchildren. He married Susannah Canby Faries, 24 November 1842, in Savannah, according to his son-in-law’s family Bible. According to family oral history, they moved shortly after marriage to a farm near Morven. That is the Bible of my great-grandfather Thomas Shepard Quarterman, who married B.W. 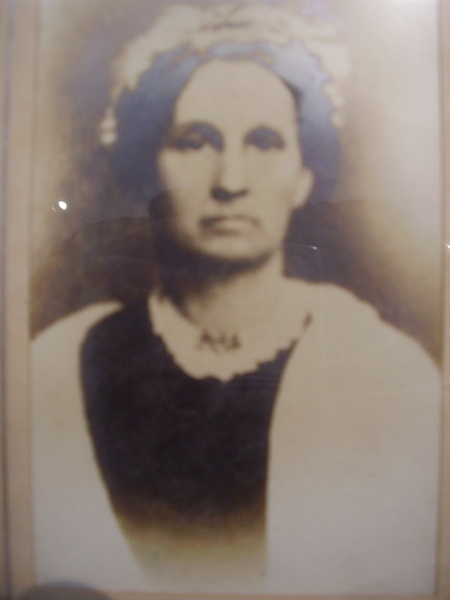 Sinclair’s daughter Susan Evalyn Sinclair, who was born 27 June 1848 on that farm, then called Bannockburn. 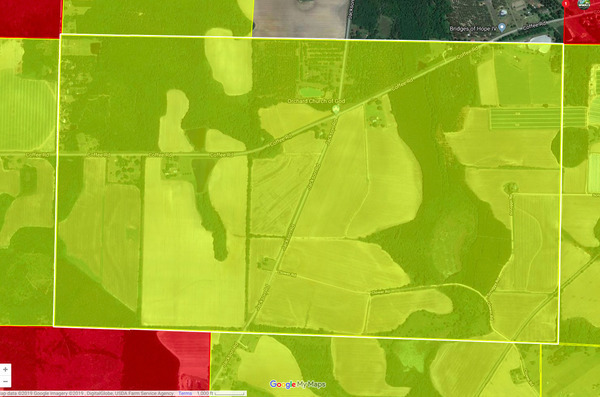 LL 314, 331, LD 12, Morven, in WRDHP google map. LL 314, 331. LD 12. Benjamin W Sinclair. Land plat. 27 September 1846. Property of Benjamin W Sinclair to be sold February 1848. 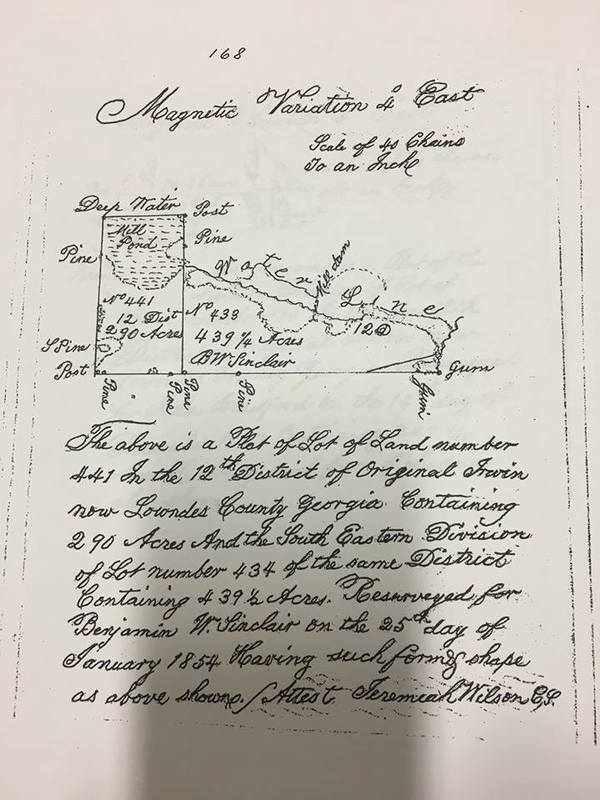 Ok, with that “to be sold February 1848,” was the Coffee Road property where my great-grandmother Susie was born, or was it B.W. Sinclair’s later property? According to previous information from WRDHP, apparently in 1845 B.W. Sinclair bought the mill at Bowen Mill Pond from George Hicks. Survey of LL 441 and 438 in 12th District, 1854-01-25, photographed by WRDHP, apparently in Lowndes County records. as above shown. Attest Jeremiah Wilson C.S. Interesting the same surveyor did both surveys. There probably weren’t many surveyors around, I suppose. Annotated detail from WRDHP Google map of old Irwin County ca. 1870. The obvious place to live on that lot would be on the high ground on Dry Lake Road now labelled as Spring Acres Farm. So maybe that’s where Bannockburn was. So he probably lived on Dry Lake Road, not at the mill. And the mill apparently was a saw mill. 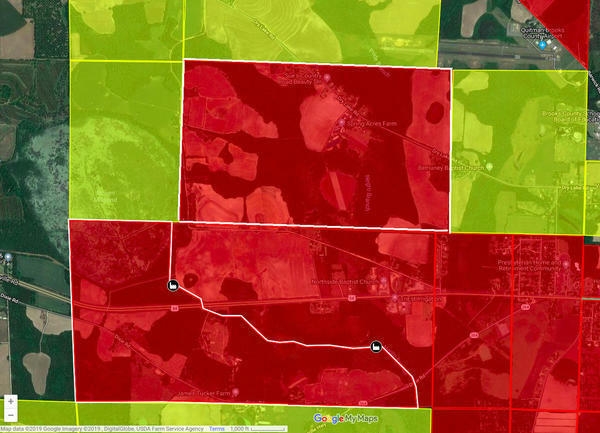 Also, 490 + 792.5 = 1282.5, which is apparently the number of acres B.W. Sinclair owned in 1971. Benjamin W. Sinclair, Susannah Canby Faries Sinclair, and their children. 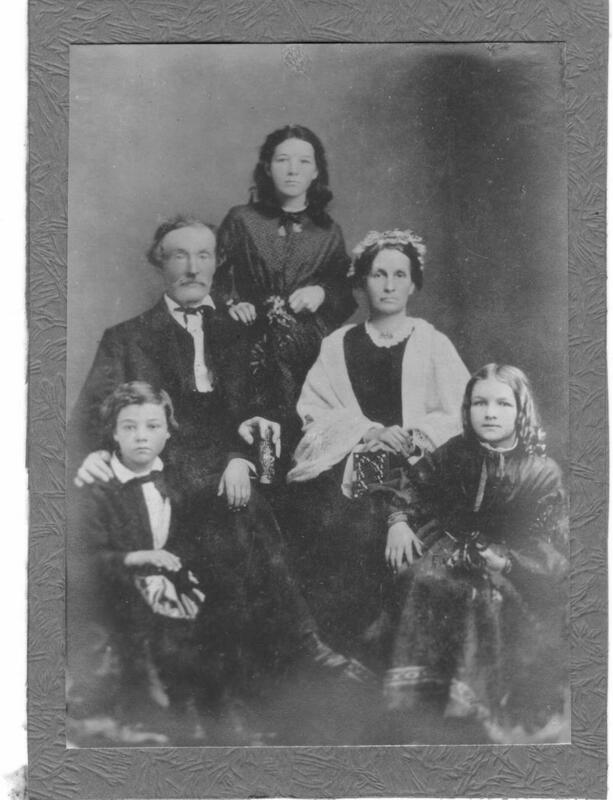 Benjamin W. Sinclair, Susannah Canby Faries Sinclair, and three of their children, Benjamin Thomas Sinclair, Amelia Henrietta “Melie” Sinclair, and Jane Elizabeth “Janie” Sinclair. Benjamin Waters Sinclair died 7 July 1878, and his wife Susannah Canby Faries died 3 July 1890. They are buried in West End Cemetery in Quitman. Here is some context for where these B.W. Sinclair lots were located on Coffee Road and Dry Lake Road. Quitman, Morven, and Hahira are labelled, as are the three successive Lowndes County seats of Franklinville (1825), Troupville (1833), and Valdosta (1860). 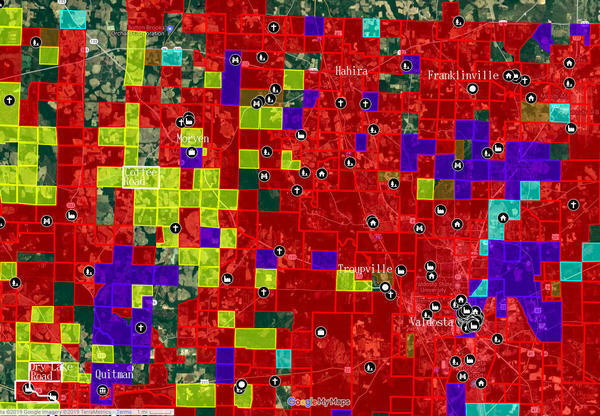 Thank you, Wiregrass Region Digital History Project (WRDHP), for turning up all this interesting new information. This entry was posted in Okra Paradise Farms, Water and tagged Bannockburn, Benjamin Waters Sinclair, Bowen Mill Pond, Brooks County, Brown Dog, Coffee Road, Downing Creek, Dry Lake Road, Genealogy, George Hicks, Georgia, Gretchen Quarterman, Gum Creek, Hicks/Sinclair Mill, Jackson Road, Jane Sinclair Quarterman, Jeremiah Wilson, John S. Quarterman, Little River, Liverpool, Lowndes County, Mill, Morven, Okapilco Creek, Okapilco River, Okra Paradise Farms, Piscola Creek, Savannah, saw mill, sawmill, Scotland, ship, Slaughter Creek, Surveyor, Susannah Canby Faries, Suwannee River, Thomas Shepard Quarterman, Thurso, Victoria, Water, Wiregrass Region Digital History Project, Withlacoochee River, WRDHP, Yellow Dog on February 10, 2019 by John S. Quarterman.